While Oz is, in many ways, a utopian land, I have to say that its legal system appears to be rather a mess. It is an absolute monarchy, which means Ozma can technically make and enforce whatever laws she likes, but much of the time she doesn’t even try to be unbiased. 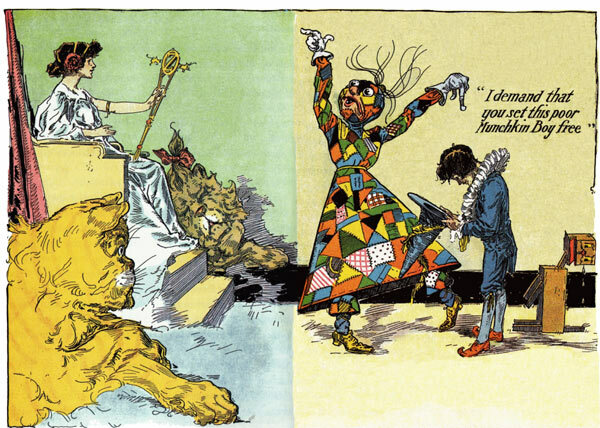 In The Tin Woodman of Oz, we’re told that the only law in Oz is “behave yourself,” but that isn’t exactly in line with Patchwork Girl, in which we learn that both practicing magic without a license and picking six-leafed clovers are both illegal. I would have to say that “behave yourself” is more of a symbolic law than an actual one. We see two trials in Ozma’s court during the course of the series, one in Dorothy and the Wizard and one in Patchwork Girl. The former is the trial of Eureka the Kitten for murder of Ozma’s own pet piglet, yet Ozma herself serves as judge. We are told that “the people of that Land were generally so well-behaved that there was not a single lawyer amongst them, and it had been years since any Ruler had sat in judgment upon an offender of the law.” Since there are no full-time lawyers (well, we later learn there are some in small communities like Utensia and Bookville, but they don’t have much bearing on the subject), the ruler appoints the Wogglebug as Public Accuser and the Tin Woodman as Eureka’s defender. Both do a pretty terrible job. There’s also a jury, which is apparently required by law predating Ozma’s reign to include at least nine members, but all of the jurors the princess chooses are personally acquainted with both her and Eureka. When they reach a verdict, it has little if anything to do with the arguments put forth by either temporary lawyer. The kitten is declared guilty, but is let off when it turns out the piglet is still alive after all, even though she did intend to eat it. In Patchwork Girl, Ojo is put on trial for picking a six-leafed clover. Ozma is once again the judge, but there’s no sign of a jury. In the equivalent scene in the silent film version, however, there is indeed a jury, made up of the Tin Woodman, the Scarecrow, the Braided Man, a Hopper, a Horner, and a Tottenhot. This trial seems to be more to scare Ojo into behaving than to actually prove his guilt, since Ozma and the Wizard of Oz already know that the Munchkin boy picked the clover, and the Patchwork Girl hid it in a vase. The ruler lets Scraps try to defend Ojo, then has the Wizard reveal the clover to everyone present. The boy admits to having committed the crime, and Ozma forgives him. We don’t see much, if any, of the Ozian justice system in action after this. Even when Mombi is executed in Lost King, it appears to be without a trial. Maybe one takes place offstage, but Ruth Plumly Thompson never seemed to have any interest in describing such matters. In her Oz books, Ozma’s courtiers sometimes help her to dispense justice, but there’s no indication of a formal system for doing so. Edward Einhorn does include a trial in Living House, however, this time with the Scarecrow serving as both accuser and defender. Apparently, even after all these years, the Ozian justice system is still very unusual. This entry was posted in Edward Einhorn, John R. Neill, Oz, Oz Authors, Ruth Plumly Thompson and tagged braided man, dorothy and the wizard in oz, eureka the pink kitten, hoppers, horners, ojo, ozma, patchwork girl, professor wogglebug, scarecrow, the living house of oz, the lost king of oz, the patchwork girl of oz, the tin woodman of oz, tin woodman, tottenhots, wizard of oz. Bookmark the permalink. 1 Response to Bother the Law!